First of all, I was so touched by the encouraging and thoughtful feedback regarding this post from last week. Thank you to everyone who reached out with a comment or tweet! I've been thinking a lot about why I continue to write here, and so much of it has to do with the incredible community, and the fact that I never feel alone when I open up about something I'm struggling with. It means more to me than you could ever know! So, thank you. This week was actually pretty great. I feel like I'm getting so much done these days. I need to write more about the idea of establishing a pretty solid weekly routine, and how much my own has helped in so many ways. I've always known I am a creature of habit, but I never realized just how much scheduling my days consistently every single week would help with my sense of accomplishment and contentment. I'm able to do more (because I'm saving specific activities/chores for certain days) and be much more forgiving of myself (I have even been taking naps here and there without feeling like all I'm doing is wasting time). There has recently been at least one night every week that Jay is out late, so instead of just trying to survive the extra-long day inside the house, I've been taking her out for an extra library run. 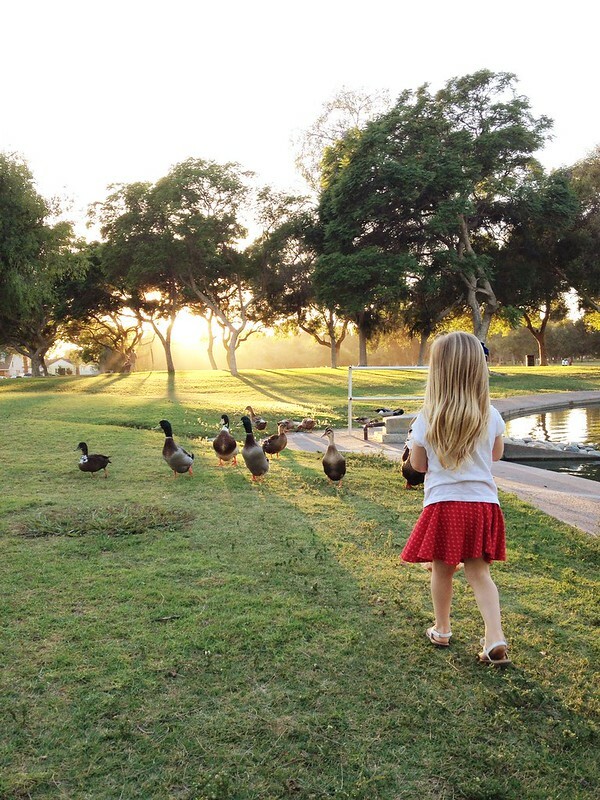 This week, to make it even more of an outing, we ended up staying at the park until sunset, feeding the ducks and running around in the evening air. It was so perfect, and I hope to do this every week now! 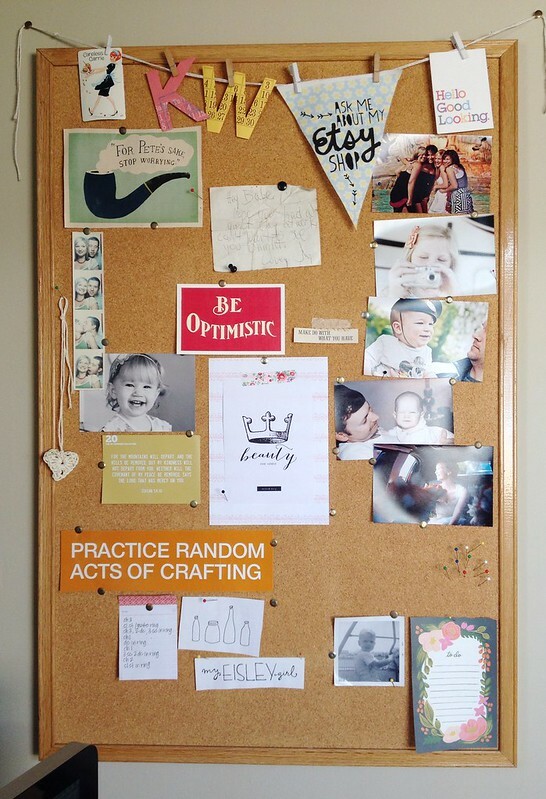 My bulletin board hadn't been reorganized in a couple years, so it felt good to start from scratch this week. I put up a handful of my favorite photos, a few doodles, some of my favorite quotations, and a few other odds and ends. I'm sure within a few months it will be filled up again, but I'm glad I made the effort to clean it up last week. I'm trying to be less cluttered and more minimalist (if that's even possible for me) these days. Inspired by Elise's cork board calendar, I turned the white board in my crafting nook into a makeshift editorial calendar and menu planner. 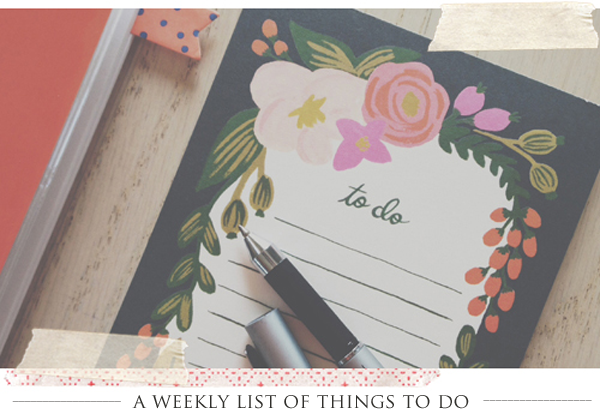 This way I'm able to jot down blog post ideas and meal plans for each day, and easily switch them as things change. I used washi tape to make the lines, which was very forgiving and surprisingly easy to assemble. I'm so thrilled with how it turned out! Kerri, do you have a good new mom devotional that you can recommend? 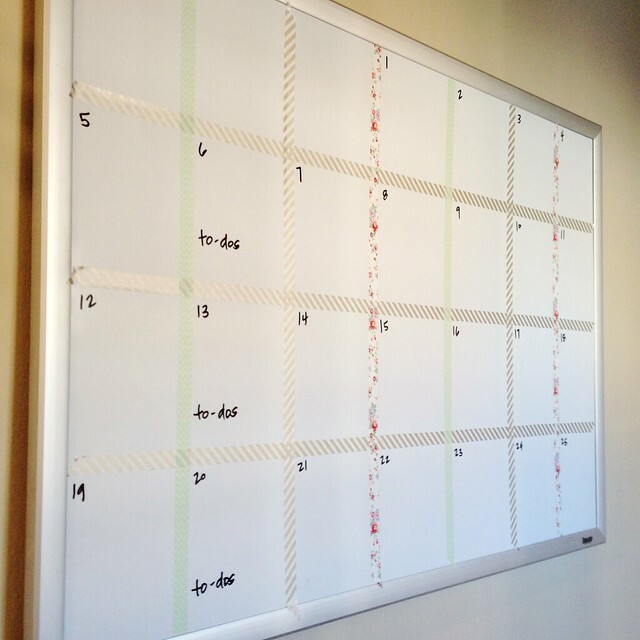 Love your white board calendar! !